With the recent developments in deep learning, the flexibility of algorithms to analyze text has considerably improved. Sentiment Analysis, also referred to as Opinion Mining, is a field within Natural Language Processing (NLP) that builds systems that attempt to establish and extract opinions within sentences or text. Right now Sentiment Analysis is a subject of large enthusiasm and development since it contains a lot of new practical applications. The available information over the Internet is constantly expanding, a large number of texts expressing opinions are available in music and review sites, forums, blogs, and social media. But really… What is Sentiment Analysis? Besides trying to identify the opinion of each text, Sentiment Analysis extracts attributes of the expression, e.g. Opinion holder: the person, or entity that expresses the opinion. As you can see with the help of Sentiment Analysis systems, disorganized information can be automatically transformed into structured data of public opinions about products, services, brands, or translations. This data can be very useful for commercial applications like marketing analysis, public relations, product reviews, net promoter scoring, product feedback, and customer service. With great pride Wordbee is announcing the integration of Sentiment Analysis within Wordbee Translator. A translation may be perfect yet lack the emotional content that you want to convey. This is why Wordbee integrates all tooling necessary to ensure the accuracy of both linguistic aspects and style. This is important when translating marketing or advertising content, websites or other public-facing material. Enable Sentiment Analysis: Activate a system in “Settings” > “Sentiment Analysis”. Scoring source: When marking files for translation tick the option to have the source text analyzed. Scoring translations: Manually from the editor’s “Actions” menu or automatically by means of QA, see next. Translation Editor: View scores as emoticons in the translation editor. Manually edit inaccurate scores. QA: Enable the Sentiment Analysis QA rule and thus ensure that no negative message gets out. Firewall: Automatically reject negative translation work. Configure your project workflow to systematically run a QA and to ensure that no negative message gets out. How to enable Sentiment Analysis in Wordbee Translator? You can manually assign sentiment scores such as “smile” or “sad” to each translation (or source text) in the new editor. But we recommend having scores calculated by a machine. Go to “Settings” then “Sentiment Analysis” and switch on a system. The list of proposed systems will evolve over time. Scores can also be manually or automatically assigned to translations from the editor. Why would you want to evaluate the sentiment polarity of source texts in the first place? Well, the idea here is that the polarity of the translation should ideally match that of the source. If the source text is hyper-positive you would expect a hyper-positive translation. If the source is negative, the translation should be, too. If the source is neutral, well, we do not want any negative sentiment in the translation, etc. Ready for more? 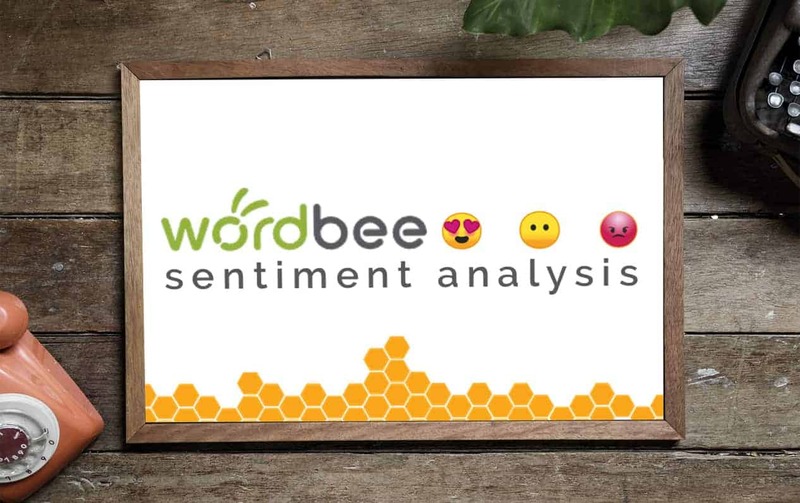 Please click here to learn more about Sentiment Analysis within Wordbee Translator.